Since several years, cooking oil section in supermarkets and hypermarkets has been a crowded spot, where individuals keep choosing on several cooking oil options available that are healthy to consume. Cooking oil is an essential component in daily cooking activity, be it a restaurant or home. This, in combination with increasing population percentage, especially in emerging economies, is expected to fuel the consumption of cooking oils. However, aspects related to health disorders, specifically cardiovascular disorders that occur due to consumption of unhealthy cooking oils with high fat content can negatively impact the overall sales of cooking oils. The global cooking oil market is expected to witness steady growth during the forecast period. This growth is defined by the growing use of cooking oils across regions coupled with demand for healthy oils with high nutritional content. For example, coconut oil is expected to gain higher recognition as it increases good cholesterol level and works well under high temperatures. Fact.MR analysis reveals that the global cooking oil market is projected to expand at a volume CAGR of 5.1% throughout the period of forecast, 2017-2026. Also, the sale of cooking oil is estimated to surpass US$ 342 Bn by the end of the year of assessment (2026). Key manufacturers profiled in this research report include Cargill Incorporated, Archer Daniels Midland Company, Associated British Foods (Ach) and American Vegetable Oils, Inc.
Fast paced lifestyle and changing dietary habits of customers across regions in the globe have led to increasing demand for ready to cook and easy to cook food products. These food products are convenient to cook, eat and carry owing to which consumers are largely preferring these such packaged food products. Cooking oil being an essential element in preparing ready to cook foods, the demand for cooking oils is expected to grow at a significant rate during the period of forecast. With respect to region, Asia Pacific excluding Japan (APEJ) is expected to showcase higher growth potential as compared to other regions. Moreover, the sale of cooking oil in this region is expected to increase at a higher rate during the period of assessment. The sale of cooking oil in APEJ region is largely driven by heavily populated countries such as India and China. In China, according to WHO, the rate of chronic diseases has risen since past years owing to lifestyle changes and other causes such as excessive smoking and consumption of alcohol. This has led to development of cooking oils that are high in nutritional value and promote health by increasing the good cholesterol content. For example, the demand for coconut oil in this region is expected to rise at a significant rate as it assists in fat burning to a large extent. 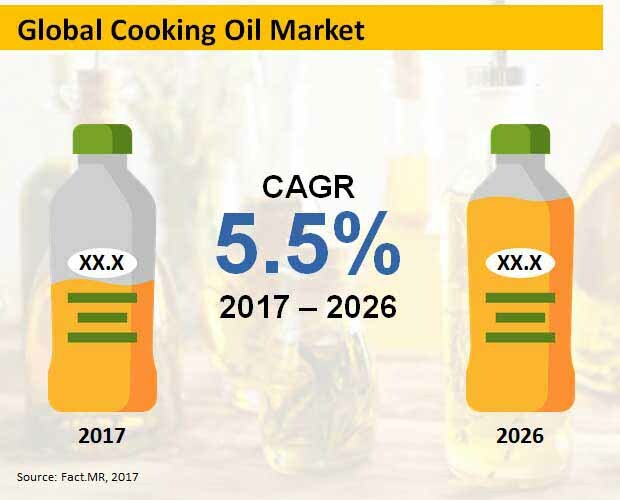 In addition, the growing rate of population in countries of India and China is expected to spur the sales volume of cooking oils in this region, thus contributing to the growth of the global cooking oil market. Demand for olive oil is expected to grow across regions during the forecast period owing to the health benefits associated with the product. For instance, olive oil is a rich source of antioxidants such as polyphenols that promote heart health. According to The New England Journal of Medicine, they are typically used in Mediterranean diet that has been followed across regions in order to reduce heart strokes and death related to heart disorders. With respect to category, refined cooking oils have gained steady demand and are witnessing higher consumption as compared to other forms of cooking oils. Refined oils promote growth of good cholesterol that helps in fighting cardiovascular disorders and reduce the bad fat content in the body. Various refined cooking oils such as coconut oil, olive oil, canola oil and extra virgin olive oil, to name a few, are gaining high preference in daily cooking activities. Conventional cooking oil segment by nature is expected to witness significant demand. The sale of conventional cooking oil is expected to increase during the forecast period. These oils have high smoke point and are available in various flavors. Moreover, they are a much preferred choice in restaurants. With respect to sales channel, hypermarkets and supermarkets are expected to largely contribute to the growth of cooking oil market. The sale of cooking oil in hypermarkets and supermarkets is relatively higher. This fact can be supported with increasing number of hypermarkets and supermarkets across reigns. In addition, consumers prefer first personal look while procuring food products and also look for varieties. These options are available in hypermarkets and supermarkets on a large scale, thus driving their growth. The hypermarkets and supermarkets segment is expected to lead the global cooking oil market during the period of assessment.